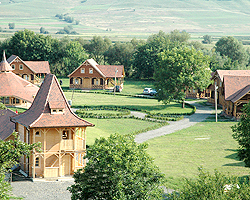 This newly established Pro Traditio pension is situated on the banks of the river Nyárád (Niraj), in a peaceful rural environment, yet within easy reach of some important historical and natural attractions. The relaxed environment, warm welcome and friendly service will ensure a truly memorable experience for every visitor. Children (aged 12-18), student and adult groups are equally awaited. There are six wooden cottages finished to a very high standard (three stars) and featuring all the comfort of home, including bathrooms. 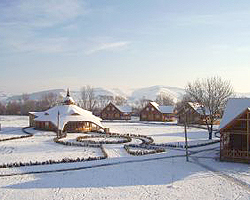 The cottages surround a central building of circular shape that homes the restaurant and is ideal scene for reunions as well. Each cottage has two tastefully decorated rooms with bathroom ensuite on the ground floor, accommodating four children at a time. 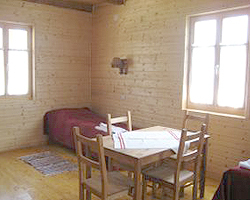 In the mansard there is a spacious ensuite room that accommodates 6 to 8 children. 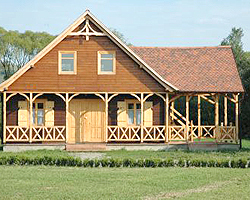 The pension is surrounded by a two-acre land which is ideal for leisure and sport activities. 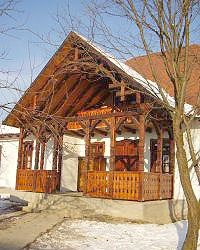 In the close vicinity of the cottages there is a guest house awaiting smaller groups or individual tourists. The house was built in the 1900s, it has recently been renovated trying to keep its character, but featuring all the comfort and conveniences of a home.There are 8 double rooms in the house, four on the ground floor and four in the mansard. Every two rooms share one bathroom. The bathrooms are fully fitted. The spacious rooms are comfortably and tastefully furnished, equipped with television, central heating, hairdryer, internet facilities. The dining room offers warm and relaxed atmosphere, where good quality home-made food is served. On the friendly porch you can relax and enjoy the friendly atmosphere. Barbeque place and open air stove is also available, where genuine home made food and bread is prepared for you. People usually arrive here as guests, and leave as friends because our services and facilities are designed to ensure that your stay in Transylvania is an enjoyable one. Here you can enjoy the magnificent outdoors on the nature trails of the nearby forests, visit the historic sites that are at a reachable distance, and get acquainted with the traditional life of village people. Forest walks, bird watching Way-marked trails of varying length, which wind through the forests and the gently sloping hillsides. Experienced guides help you to get acquainted with the rich flora and fauna of the surrounding forests. Fishing The county possesses an abundance of clean rivers and lakes, with rich fishing grounds, especially trout. 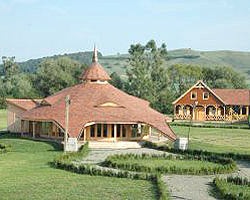 There is also a famous trout-farm nearby, where the most delicious trout-food is prepared in Transylvania. Horse riding Only a few kilometres from the psion there is a farm where you can enjoy the pleasures of horse riding, as well as leisure riding with experienced instructors. Arts and crafts Since our most important aim is to preserve the cultural traditions of the region, we pay much attention to present what the craftsmen of the county produce. We will invite craftsmen, who will let you get an insight into the secrets of their crafts: weaving, leather-work, pottery, wood carving, egg painting – just to mention only a few. You can also visit a cloth factory or a blacksmith workshop in the nearby villages. You will be invited to a folk dance performance, to get acquainted with the most beautiful dances and folk songs that are still practiced by some very devoted and enthusiastic folk groups from the region. Village life For the most enthusiastic guests, why not participate in the workings of a real farm? You can feed a donkey or goat, and at certain times of the year you can also see sheep being clipped or cheese being prepared. In the summer you can participate in the workings of harvest as well. 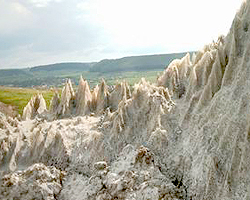 Famous Transylvanian spa, well-known for its unique helio-thermal salty lake called Bear Lake. 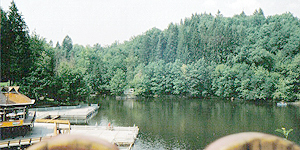 The lake was born in 1875 after a geological event. Two streams run into the salty water, producing a thin layer of fresh-water on the surface. This layer is heated by sunlight and prevents the water to cool down. The exceptionally high salt content is excellent for therapeutic treatments. 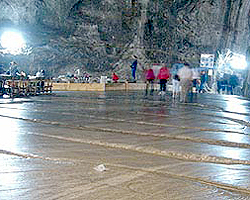 The settlement is famous for its salt-mine with huge underground halls, the remainders of century-long extensive mining. There is a unique microclimate in these halls, excellent for respiratory treatment. Equipped with buffets, playgrounds and an ecumenical chapel, the halls provide ideal and relaxing atmosphere for thousands of visitors suffering from respiratory illnesses. The medieval town of Sighisoara offers the visitor a unique atmosphere with its narrow, cobble-stoned streets, splendid architecture and ancient houses. 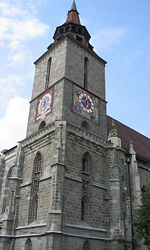 one of its most famous attractions is the 14th century Clock Tower behind the thick defensive walls of the Old Town. Equally famous is the house where – according to the legend – Count Dracula was born in the 15th century. The 14th century settlement boasts a Reformed church with beautiful wooden ceiling, while on the outer walls of the church frescoes depicting Saint George have been discovered. Another attraction is the Rhédey Palace, where the great-grandmother of Queen Elisabeth II, Claudia Rhédey was born. 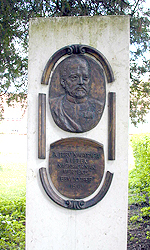 The grave of the countess is placed in the crypt of the Reformed church. Only a few kilometres from here there is a huge water storage dame, built in the last years of Ceausescu’s dictatorship. 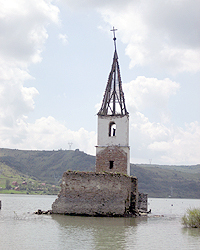 A whole village called Bözöd was flooded by the water, leaving only the church tower above the surface – sad reminder of the village destruction of that era. 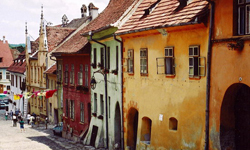 Sibiu is a fortified medieval town, the outer limits of which had been drawn by the founders with two swords. It is the home of many cultures, therefore boasts a unique multicultural life, which is present in the streets, squares and exhibition centres. 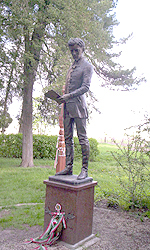 The town has become the European Cultural Capital of 2007.